Evelina’s solo concerts are usually based on her 12-piece compositional suite «Year’s Cycle» which reflects the feelings and moods of the twelve months of a year. This suite was released on a CD by Leo Records in 2004. - «The concerts based Evelina Petrova are true heartwarming experiences. 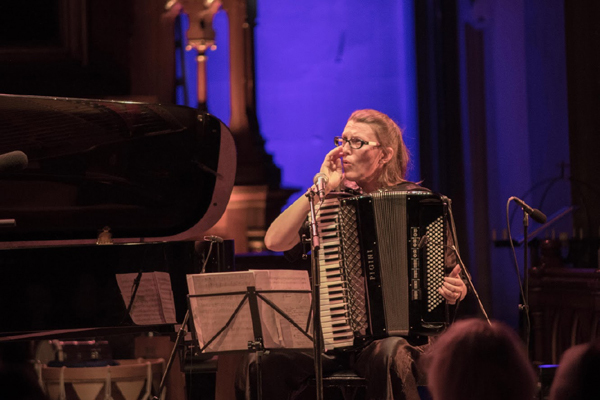 She blends Russian folk music, classical and quite avant-garde improvised music in her playing. There are also elements of Jewish Kletzmer tradition and East-European brass music in it. There’s such a big amount of power, primitive drive and creativity in her concerts that it is hard to believe that all that music comes from one woman and accordion only».